Tis the season! No, not the Christmas season just yet! Fall has always been my favorite season. Something about the leaves changing color, the crispness in the air, all the deliciousness roasting in my oven. After a summer of grilling, I love to roast hearty dishes that nourish us, and make my house smell delicious. 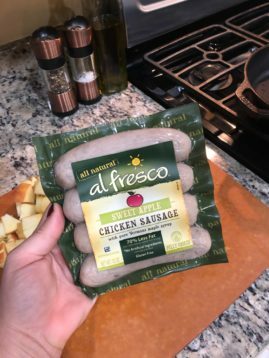 When my friends at al fresco chicken sausage asked if I’d like to partner with them to create an easy weeknight dinner, I knew I’d be roasting something delicious. Roasting is also a great way to multi-task on weeknights. While the squash roasts I can make the salad, set the table, and catch up with Mr. Big on his day. 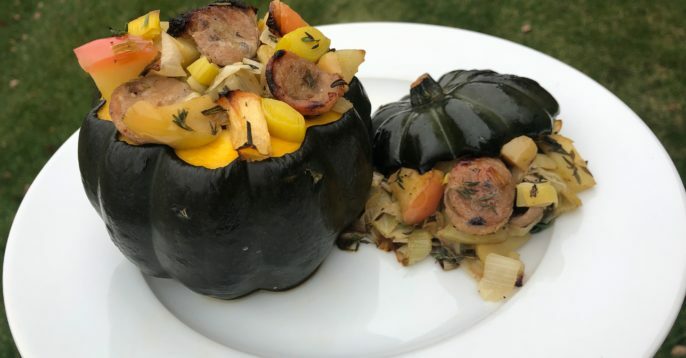 I thought about using delicata squash (#thelordsgourd), but delicata season is so short, and acorn squash are readily accessible throughout the fall and winter. Plus, delicatas don’t leave much room for the stuffing, and you’re going to want a full portion of this leek, apple, and apple sausage stuffing! I preheat my oven to 400°. 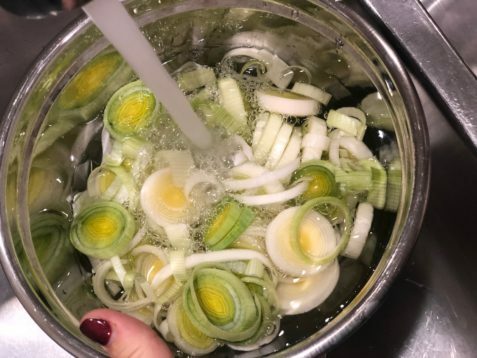 While the oven preheats, I slice my leeks like coins and separate the layers of rings into a bowl of cold water. Leeks tend to get sandy or dirty between these layers, so this bath removes the grit. I peel and finely dice my garlic cloves. I slice my washed celery on a bias for a more interesting cut than a traditional dice, then core and dice the apples. I leave the skins on for color, but you can remove them if you prefer. 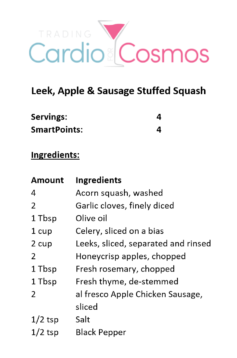 I chose the al fresco Apple Chicken Sausage because it will bring a sweet note to the stuffing and blend well with the leeks and garlic. If you’d like a little bolder flavor, you could use the al fresco Sweet Italian sausage instead! I slice the chicken sausage into a coin shape similar to the leeks. If you’d like a little more bite, you can leave the casing on the sausage like I do, or if you’d like it to crumble, you can remove the casing. I finely chop my rosemary, but I actually leave the thyme leaves whole. I just remove them from the stem. I drain all the water from the leeks, then pat them dry with a paper towel. With all my ingredients ready to go, I put 1 Tbsp olive oil into my Lodge Cast Iron pan, then add the celery and leeks. I cook them until soft, approximately 4-6 minutes. The leeks will start to “melt,” which is how I describe them losing their shape altogether. 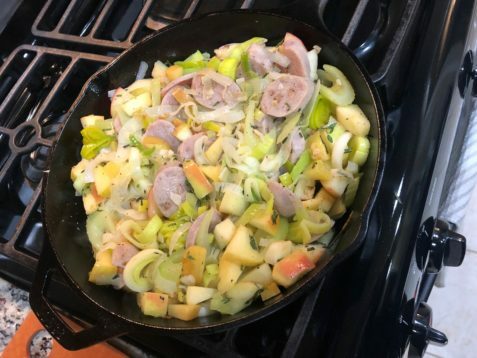 I add the garlic (putting it in later ensures it won’t burn), apples, chicken sausage and the herbs and cook for another 4-6 minutes until the leeks start to brown and everything is heated through. I add salt and pepper to taste. Adding your salt and pepper throughout the cooking process is an Ina Garten trick. If you add it at the end, the salt just tastes like salt. 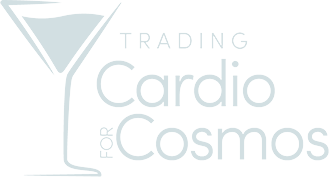 If you add it into a recipe during cooking, it will blend and enhance the flavors of your ingredients. I put the stuffing mixture in a bowl, ensuring I scrap all the delicious brown bits from the bottom of the pan. I like the way the acorn squash looks when it’s presented standing up vertically on the plate, so I cut the top and bottom off the squash. I try to ensure I cut just the tip of the bottom of the squash off so it’s still a bowl and I reserve the top so I can serve it like a little hat topper on my squash. *If you’re short on time, you can absolutely cut the squash in half and adjust the cooking time by 10-15 minutes, depending on your oven. I roast the squash the cast iron pan for 25 minutes, then add the stuffing mixture to each squash and cook any extra stuffing in a glass pyrex dish with the squash tops. I cook them for another 20 minutes, or until the squash are fork tender. 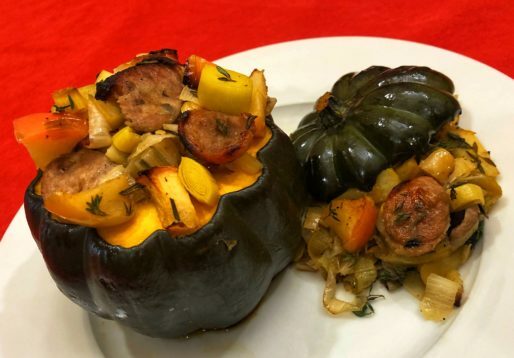 I serve each squash on a plate with a little garnish of leftover stuffing, the squash “topper,” and fresh thyme. Best of all, these squash are a BIG portion for 340 calories or 4 WW Points each! What do you think? Would you add these to your menu plan?